Ousmane Dembele ‘is a better player than Neymar’, according to Barcelona president Josep Maria Bartomeu. The France international signed for the Catalan giants for £96million plus add-ons in 2017 after Neymar left for PSG for a world record fee. The Brazilian has been regularly linked with a return to the Nou Camp but Bartomeu refused to say whether this is the case. ‘Is a Neymar return possible? I cannot confirm or deny this,’ Bartomeu told Cataluna Ser radio. ‘We received a lot of money for Neymar and we invested it in our future planning, you can see that with our signings such as Dembele and (Philippe) Coutinho. Dembele scored four and set up nine goals for his team-mates in his first season while Neymar scored 28 goals and assisted 16 in his first campaign at PSG. This season, Dembele has 13 goals and eight assists while Neymar has 20 goals and 11 assists in 10 fewer matches than Dembele. 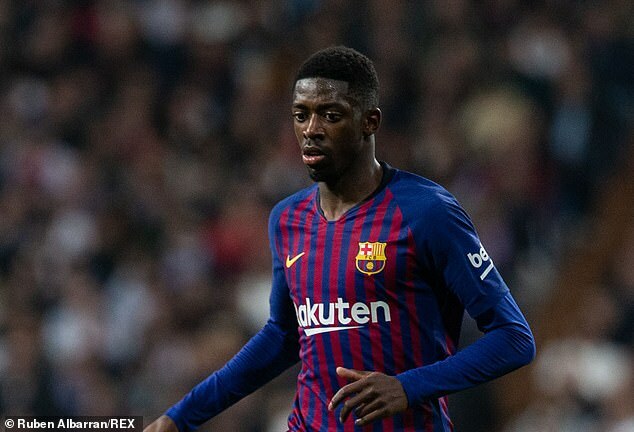 The Brazil international won Ligue 1, the French Cup, the French League Cup and the French Super Cup in his first campaign while Dembele won La Liga, the Copa del Rey and the Spanish Super Cup.